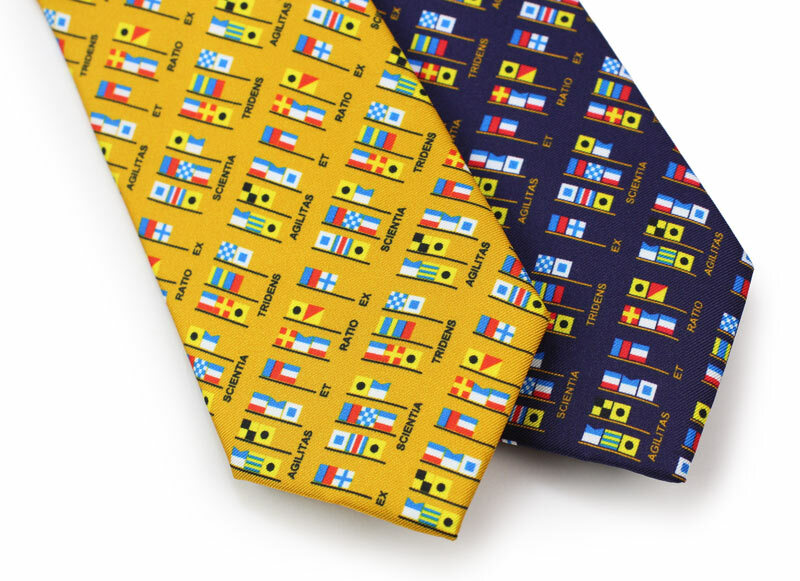 Looking to get custom clip-on ties made? Then contact us. 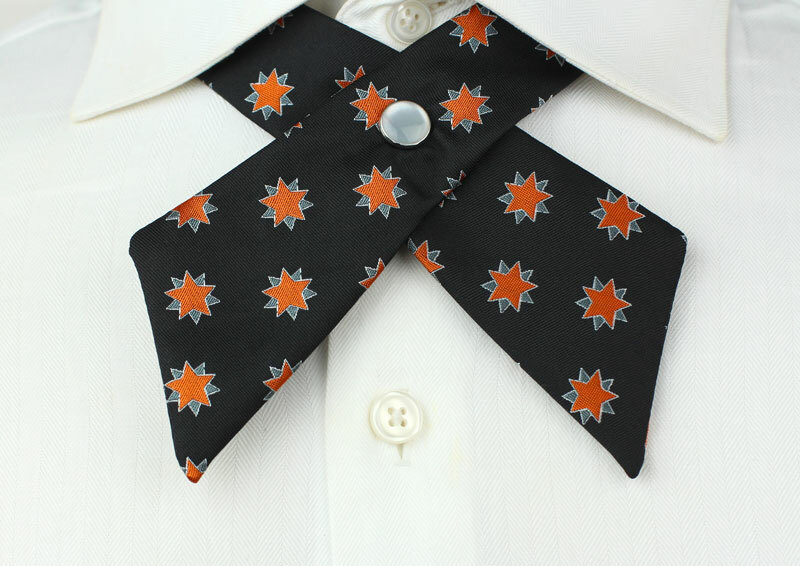 We can help with regular self-tied neckties and bow ties as well as pre-tied options. 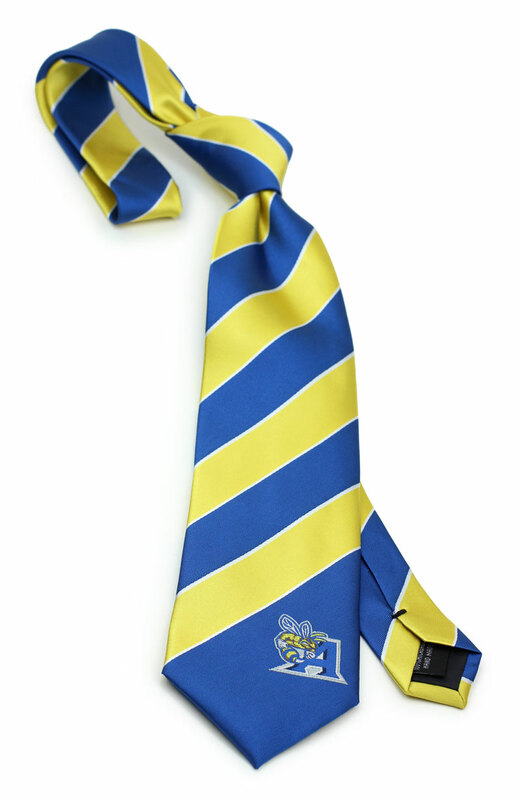 Want custom ties made for your club? Then contact us and tell us what you are looking for. 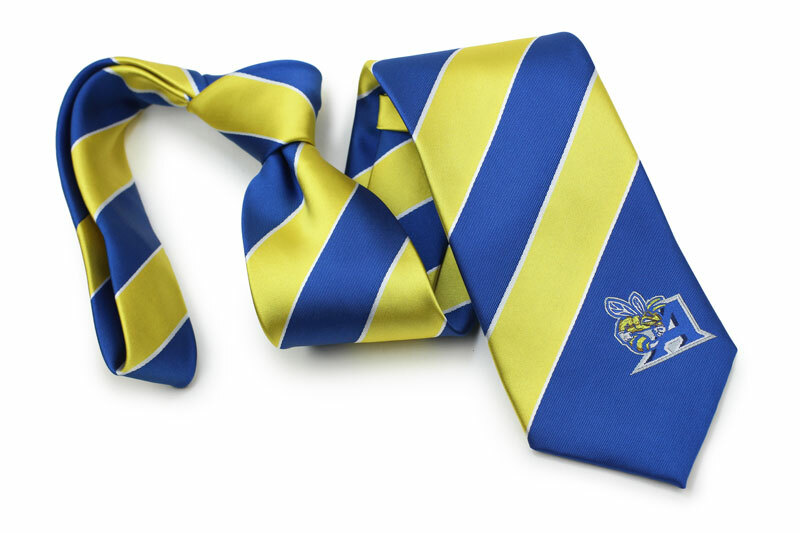 We can create custom ties and scarves in any color, pattern, and add any logo or design. Get free design suggestions in just one business day. 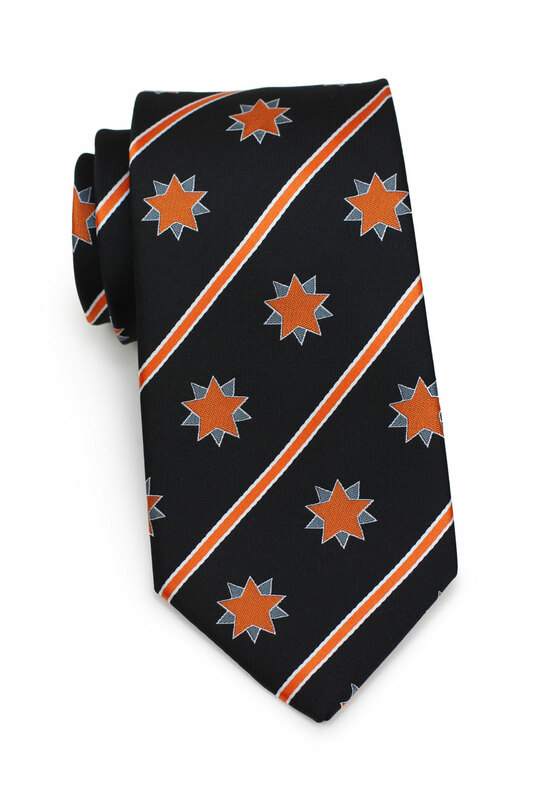 By now we have created custom ties for any type of sports team imaginable. 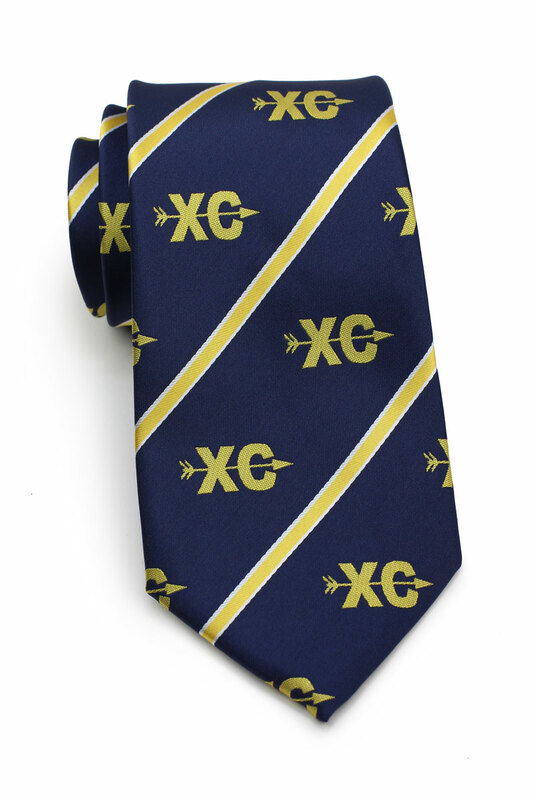 While most of the sports are football, rugby, hockey, and lacrosse, recently we made custom ties for a high school cross country team. 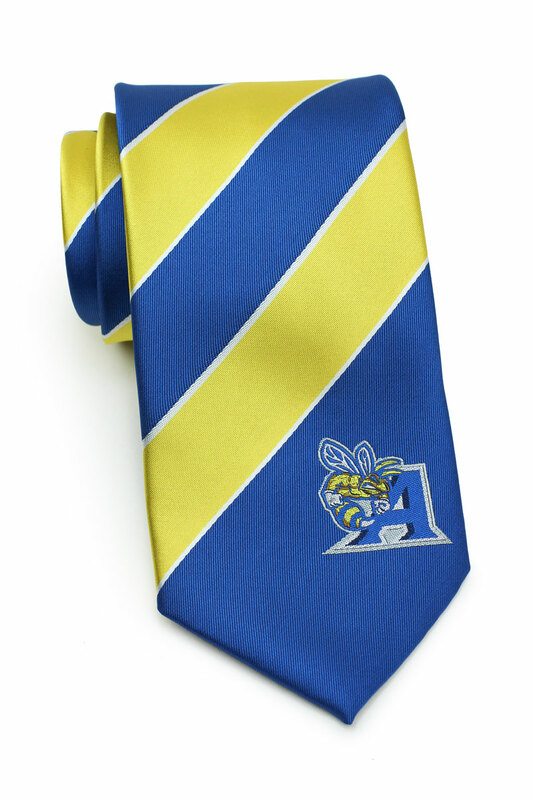 The customer wanted a yellow and navy striped tie with their logo embroidered in between the stripes. 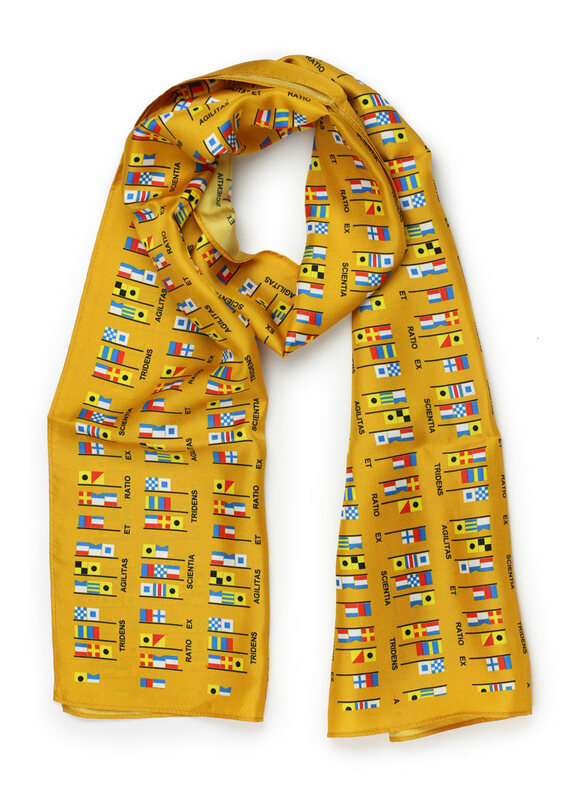 After some design suggestions we finalized a design and went into production. 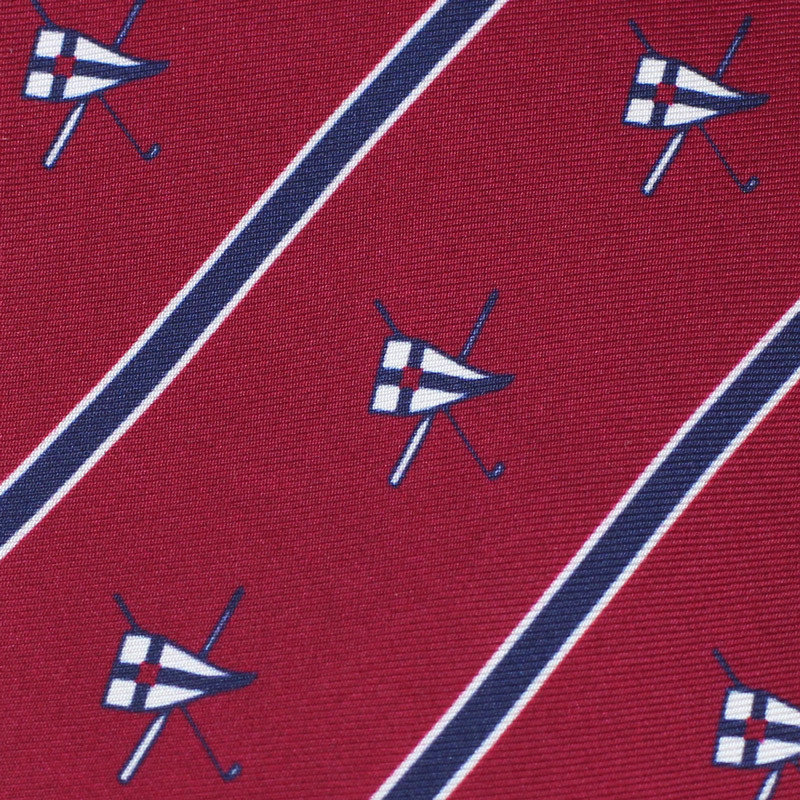 Below are detailed photos of the final tie. 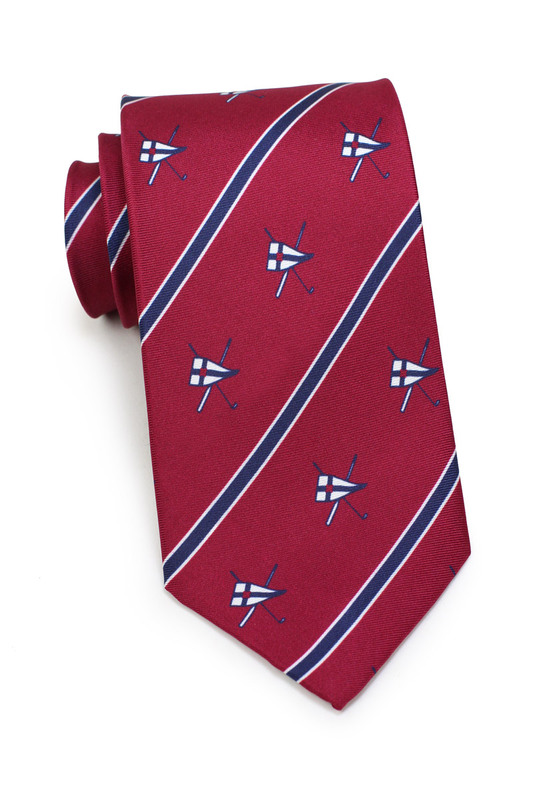 Need custom ties made for your team? Then we can help. Contact us and send us your logo/mascot and we will create design suggestions at no charge. 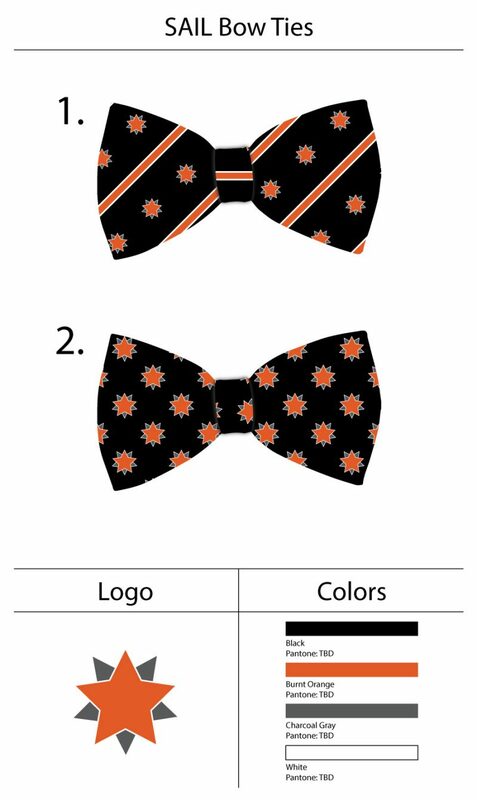 The customer liked the scale and logo placement of design 2 above but also wanted to see it with a black background. 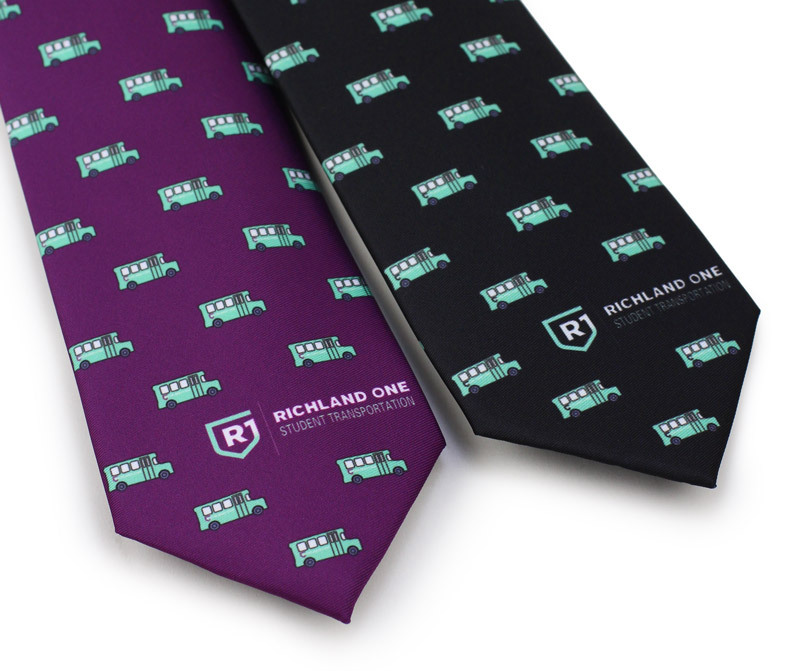 Eventually the customer decided to have both made in black as well as purple. 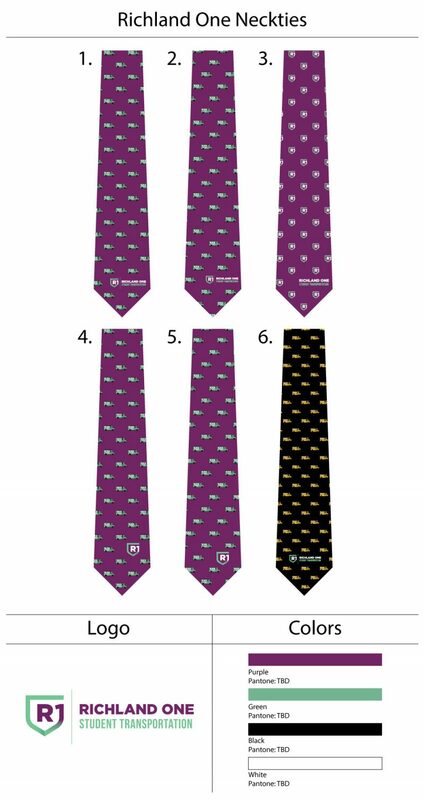 Below are detailed photos of the final ties. 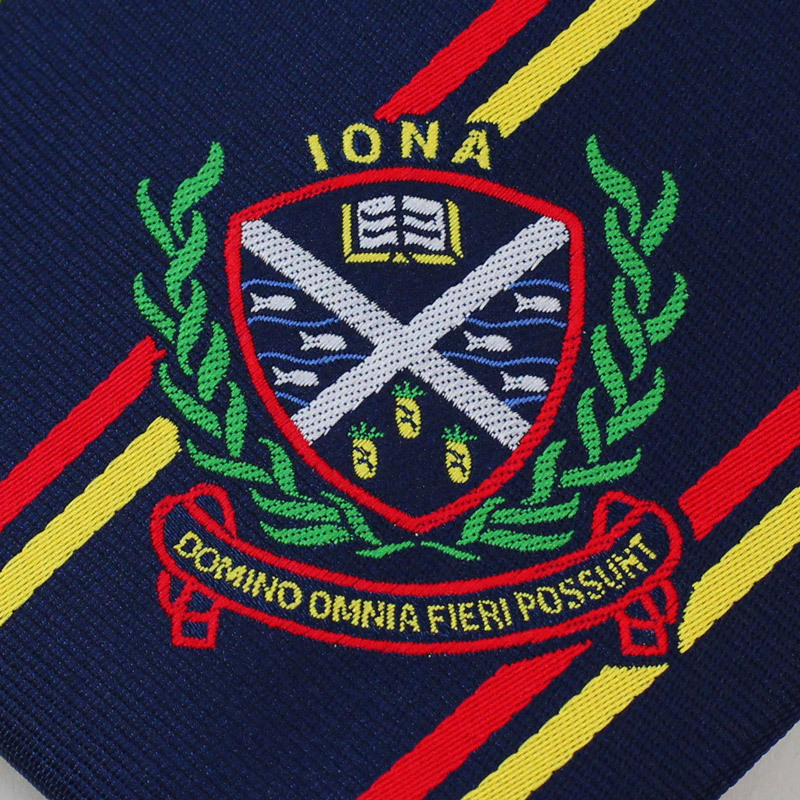 Because of the detailed all over logo placement, we opted for a digital imprinted fabric that shows much more detail compared to a woven fabric. 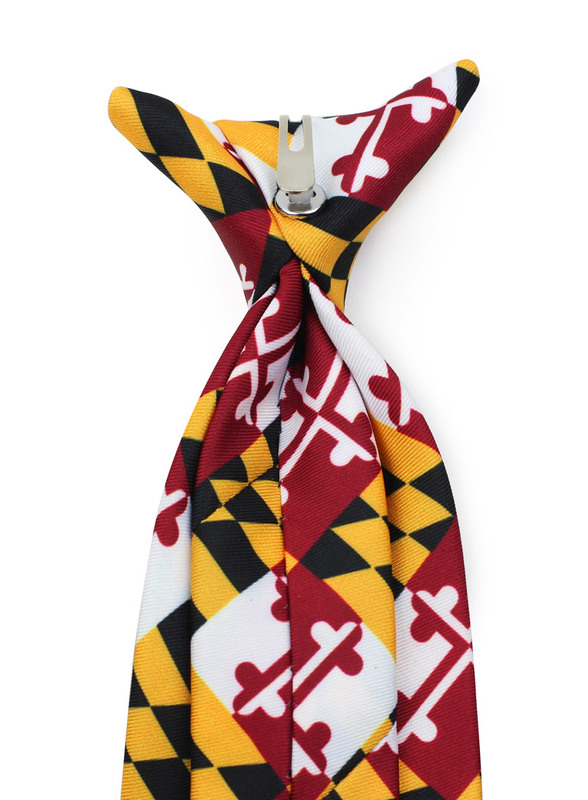 Looking to get custom ties made? Then let us help you with the design work at no cost. 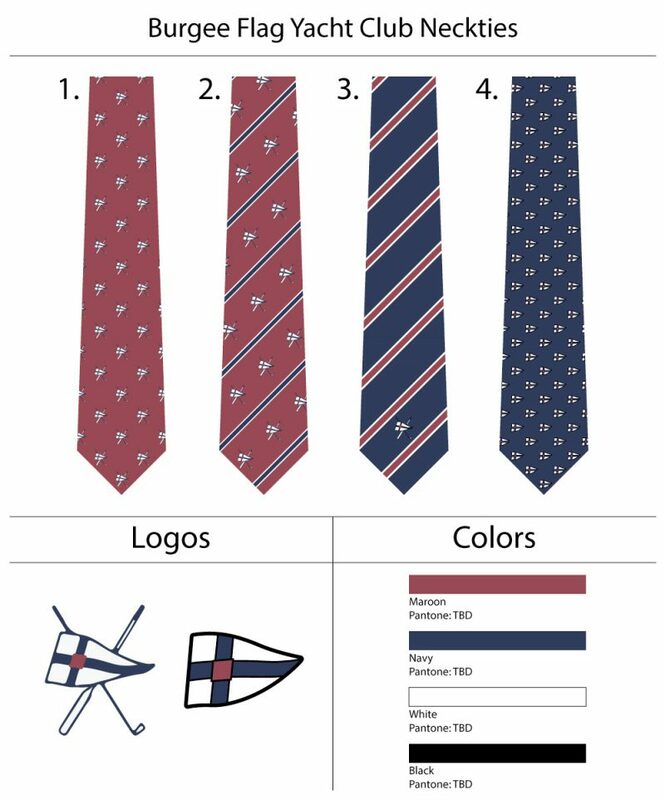 Send us your logo and design requirements and we will get to work. Get free design mock ups in just one business day. 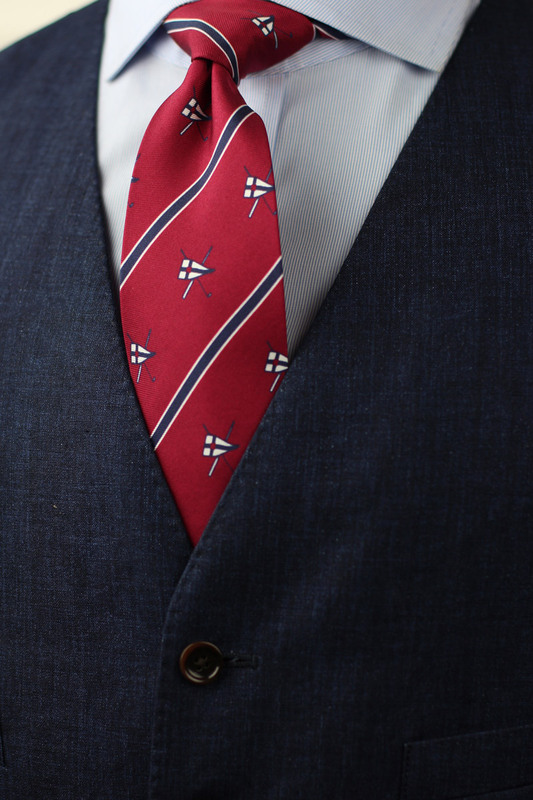 Contact our custom tie + scarf team and we will gladly help. 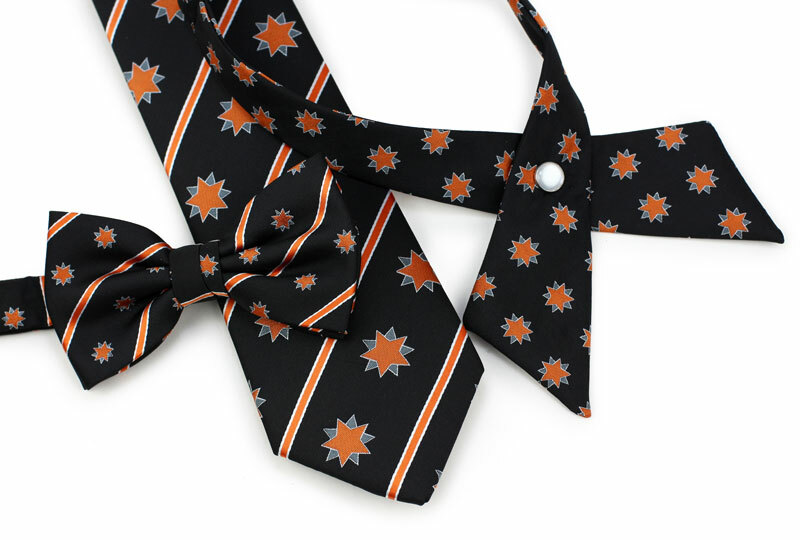 Recently we had the opportunity to create a really unusual custom design. 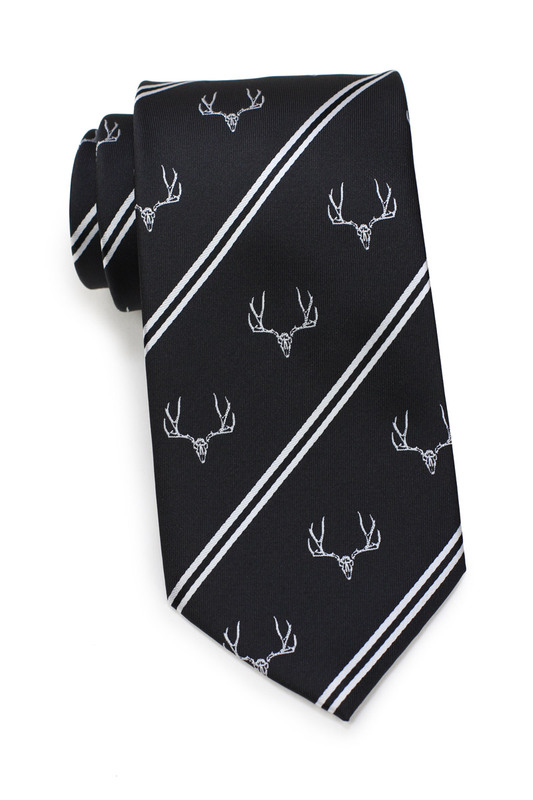 One of our clients wanted a trendy and fashion-forward design in a black and silver color palette showing of their stag logo. 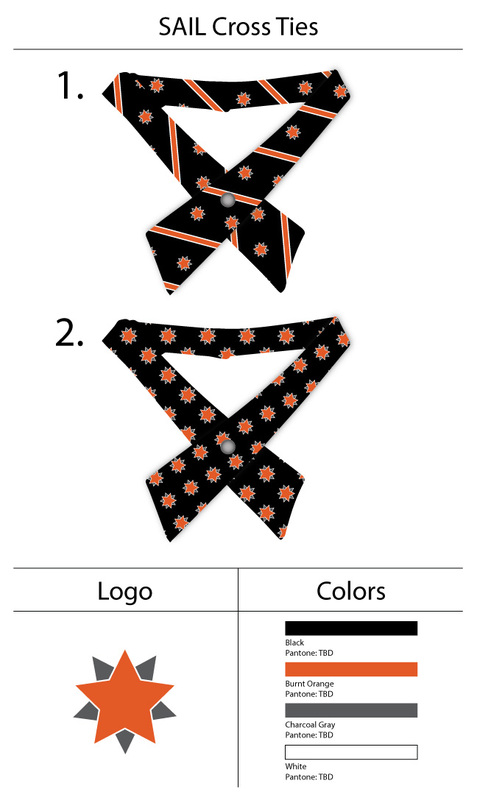 After some design suggestions and edits using customer’s feedback. 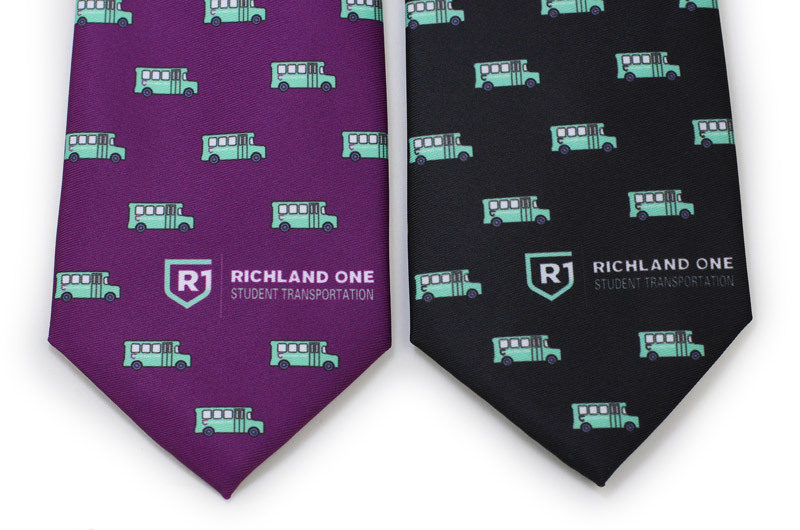 We created two different ties. 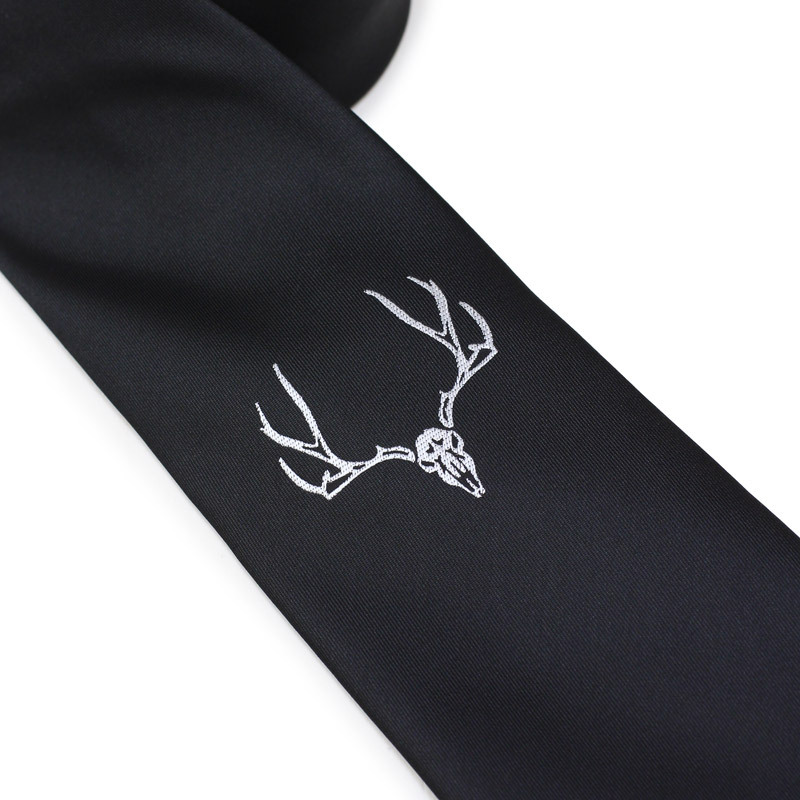 For the second design we created an even bolder look of a trendy solid black tie with a single stag logo half way up the tie. 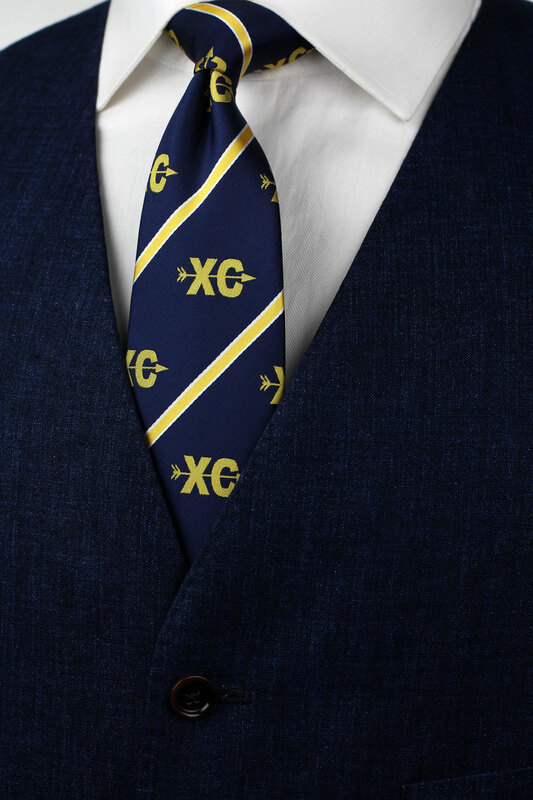 The logo is visible when jacket is worn open. 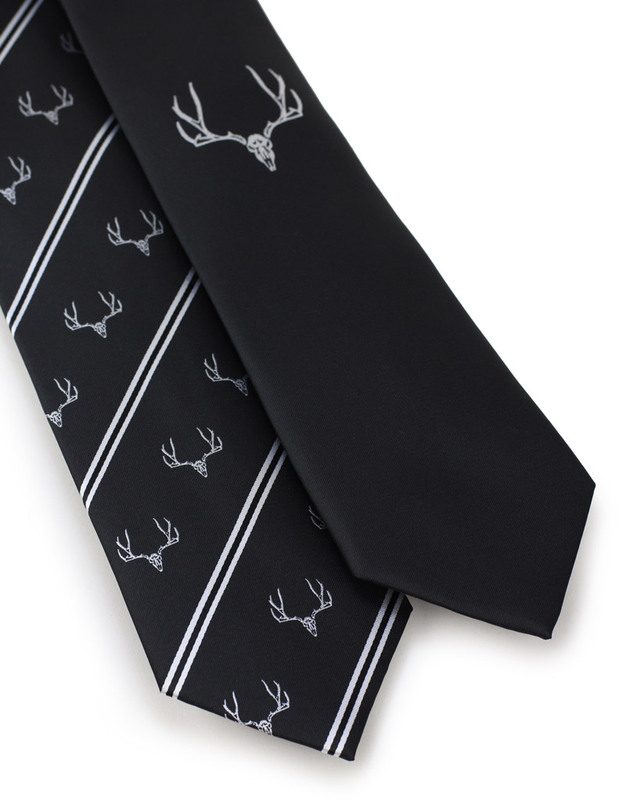 Want custom ties made? Then contact us today and our design team will gladly assist with design work at no charge. 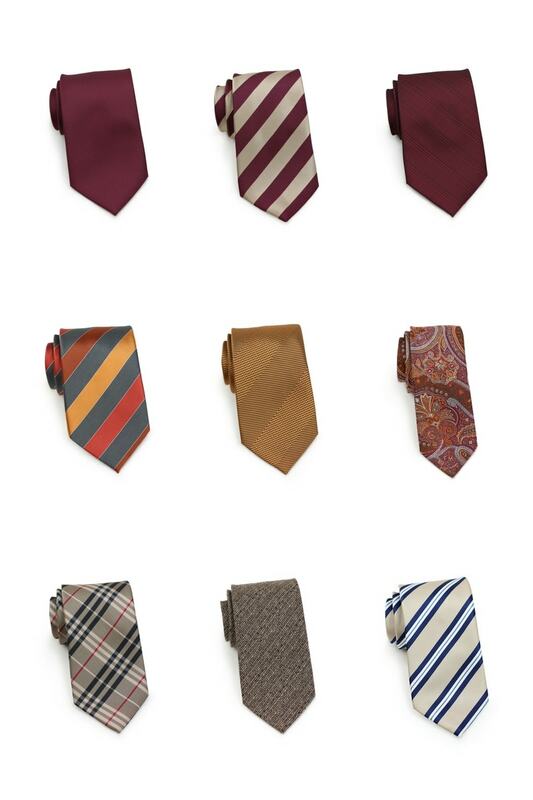 Our minimums are 30 pieces with a turnaround time as fast as 30 days. 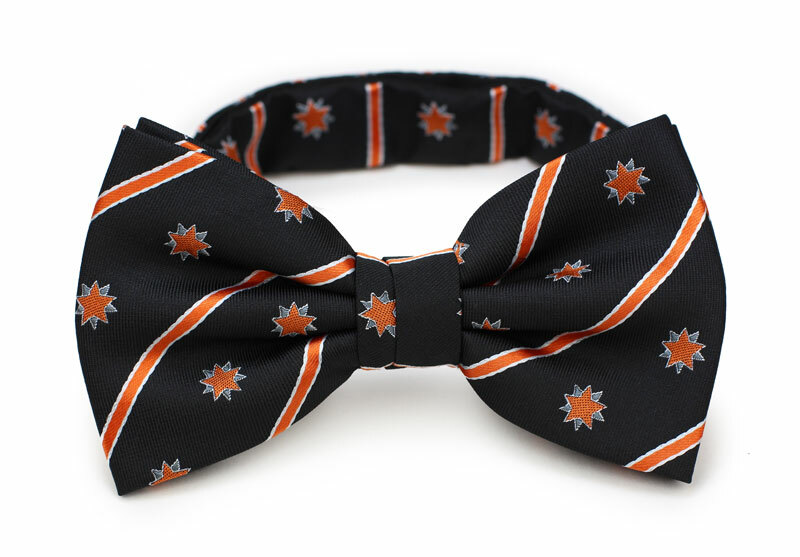 Looking to get custom ties, bowties, or scarves made? 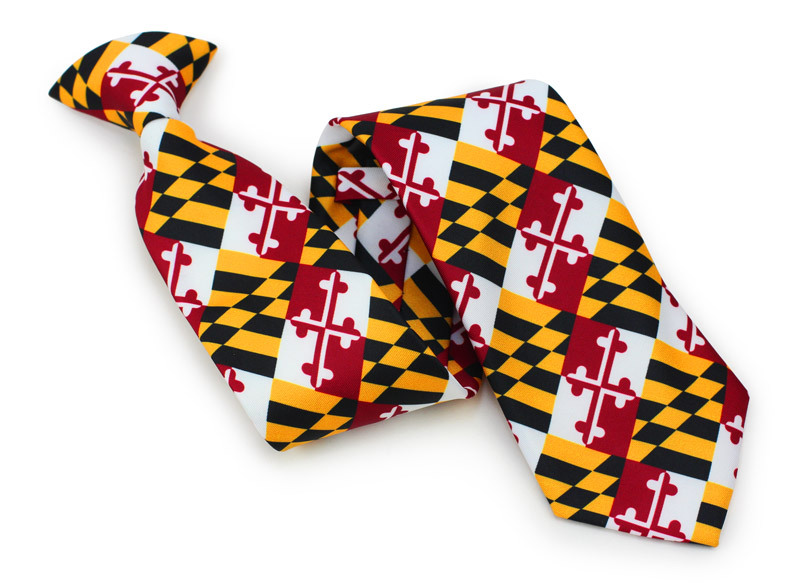 Then we would gladly assist with free design work. 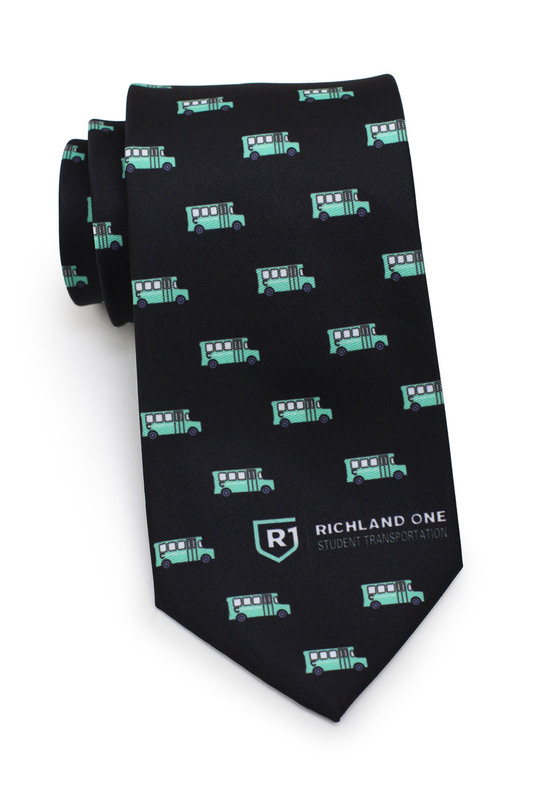 Just contact our custom tie team and tell us what you are looking for and we will get back to you within one business day with free design suggestions. 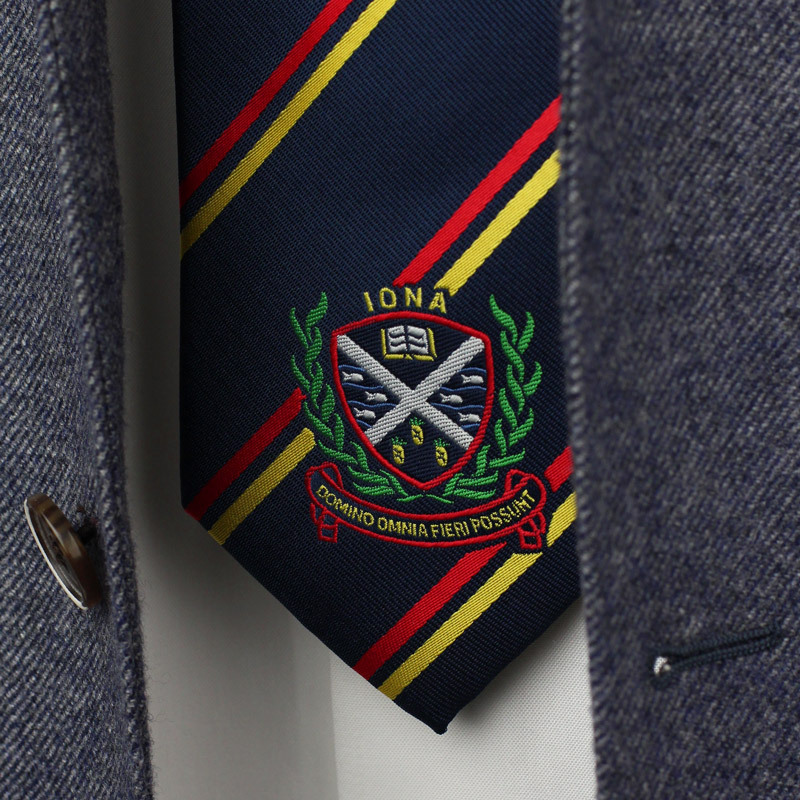 No matter your school colors, we can create custom striped ties for you. Want a logo added as well? Not a problem! 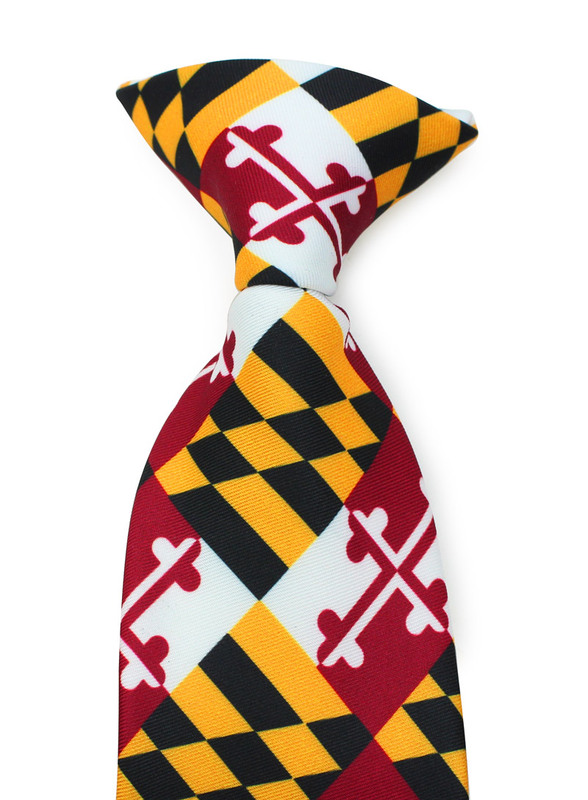 We offer woven and printed ties and can match any color palette and create any logo. 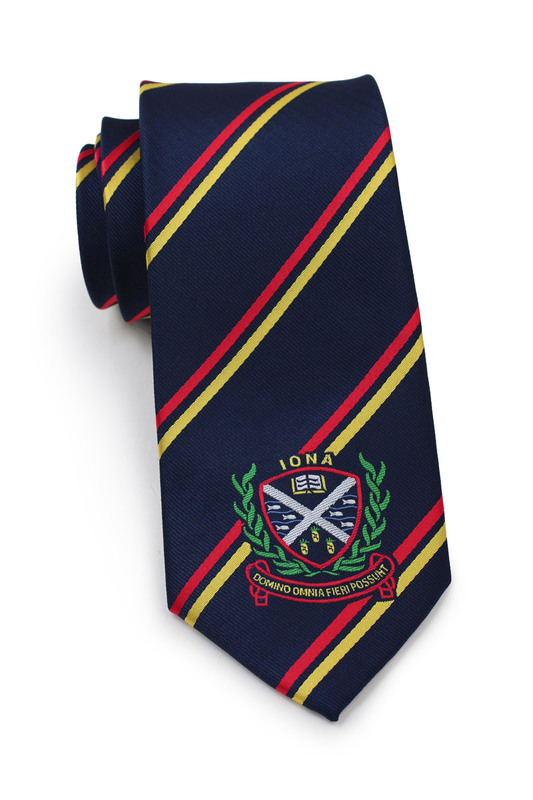 Below is a recent example of a classic satin finish striped tie we did for a school. Because of the different age ranges we created this tie in 3 different sizes: kids, teenagers, and adults. 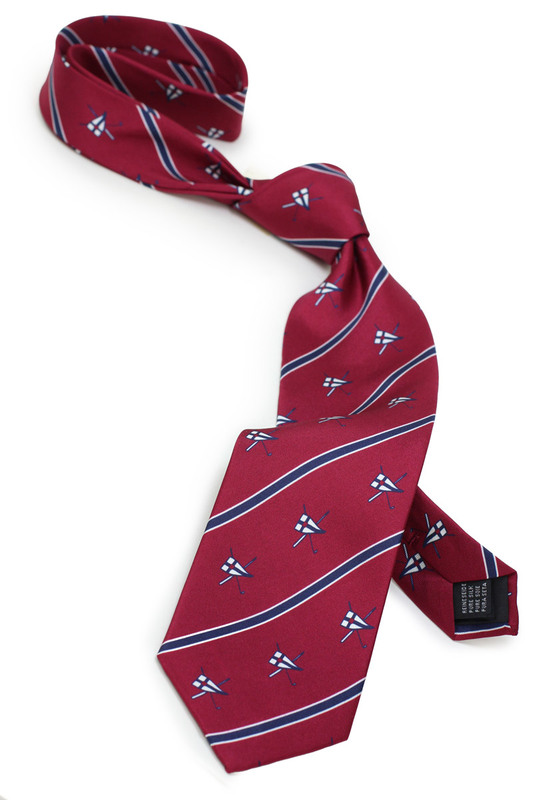 Need custom ties made? Then contact us and we will gladly assist with free design suggestions. 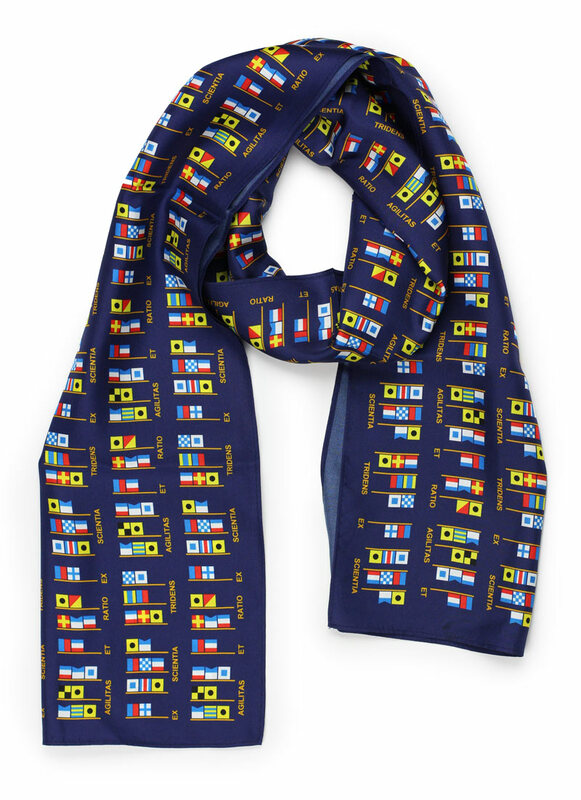 Looking to have custom ties and/or scarves made? Then we can help! 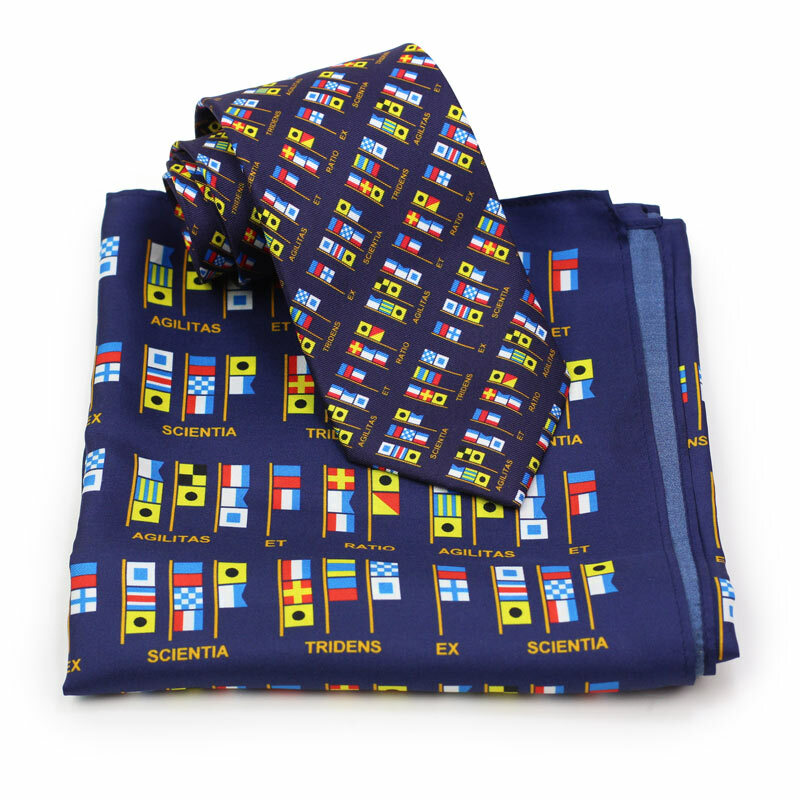 We can produce in 100% silk, microfiber, cotton, and wool. 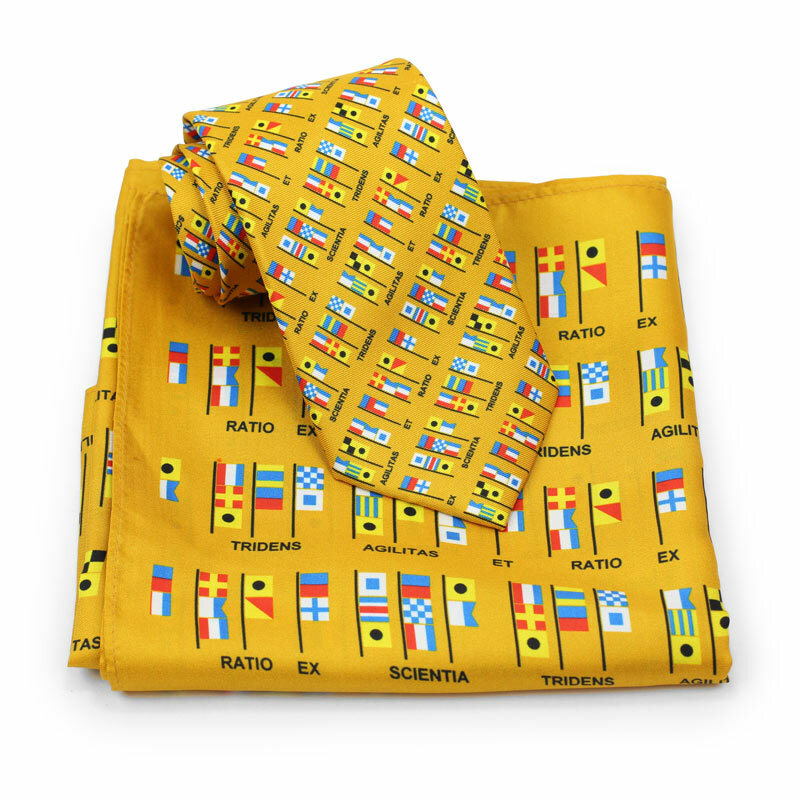 We can produce any pattern, add logos or crests, and even offer custom packaging and private labeling. 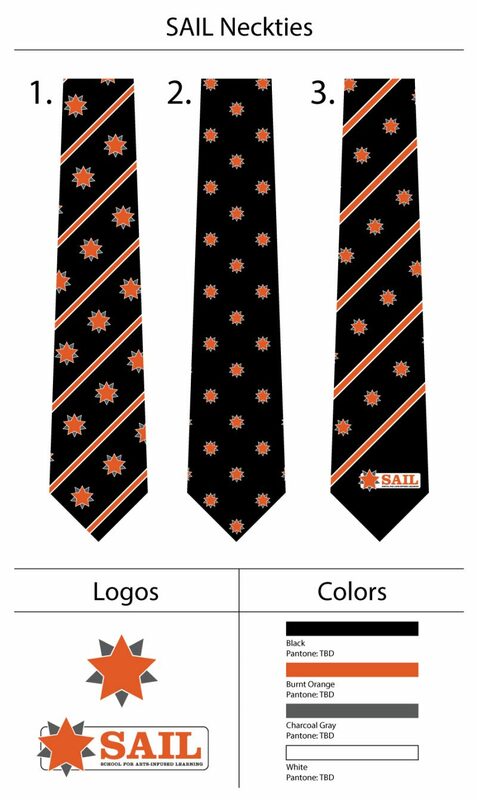 Contact our custom ties and scarves team today and we would gladly help make free design suggestions using your colors and logo.